Agadam is a 2014 Indian Tamil film released on Jan 03, 2014. The film is directed by Mohamad Issack. This is a Kollywood Film. The movie features: Tamizh, Srini,Iyer,Sri Priyanka,Baskar,Kalaisekaran,Saravana Balaji,Anisha. The film has been directed by Mohamad Issack. Agadam Is A Kollywood Film. Tamizh, Srini,Iyer,Sri Priyanka,Baskar,Kalaisekaran,Saravana Balaji,Anisha Acting In This Movie, Directed By Mohamad Issack. Check out this page for more updates on Agadam. Three men bury a woman they have murdered in the middle of the night. They get an unexpected visitor, who wants to do business with them. Soon, the ghost of the dead girl turns .. This page provides latest and updated information about Agadam (2014) movie which released on Jan 03, 2014. 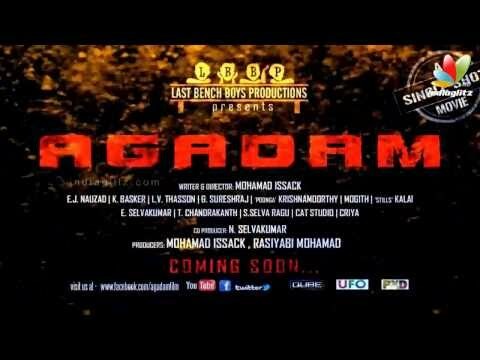 Agadam (2014) is directed by , produced by , starring .We have also provided 2 trailers and videos, 0 photos, 0 user reviews, and 0 critic reviews.You can review, like, dislike this movie and also can add to favorites. You can also find information on showtimes, CDs, DVDs, online rental, online free watching.